The land included plots which for years villagers have tended for gardens. Immediately after independence, land was given by the state. Later, rents were imposed. 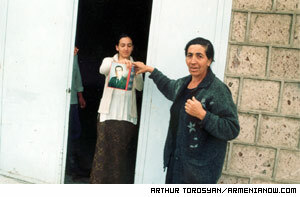 Astghik Toroyan says no one remembers her son. When the land went up for sale, most of those villagers were not among the bidders because they could not afford the average price of about $445 per 1000 square meters plus about $60 in administrative sales costs. Some villagers had no choice but to somehow find the money that, for them, is a massive sum. The land is their source of sustenance. But those who couldn’t afford to buy the property now face a dilemma. “We have to pay those sums of money within ten days. And we have ten more days for settling matters in cadastre. They established prices which are terrible and I have no idea what I am going to do,” worriedly says Astghik Toroyan. Toroyan charges that the head of the village had secretly sold the land on which she had been paying rent to the government for two years. For nine years she had scrupulously been paying rent for 5000 meters of land. To keep the land would cost about 1,274,000 drams (about $2,300) plus 180,000 drams for registration (about $330). This land plots allotted to Toroyan's family nine years ago were uncultivated, deserted and full of stones. After years of hard work these lands have been turned into fertile and fruitful lands, however, as a result of the lack of water in the village she grows only wheat there. “If my son were here with me then I would never rely on you,” Toroyan says, as if addressing village head Lyudvig Khlkhatyan. “My heart is broken, I don’t trust this government." Toroyan’s son, 23-year-old lieutenant Aharon Toroyan, died in an accident during military service in 2001. Years ago Astghik also lost her 13-year-old daughter. Today she lives together with her student daughter and son. A few years ago her husband left for Russia for making money there, however, there he became seriously ill and now he cannot work. Astghik Toroyan is in poor health. And, despite her hard social conditions and the fact that she lost a son in the Army, there are no privileges for her which could have helped her and provided with some discounts in the prices for land. Head of the village has already refused to help Astghik to pay at least the necessary taxes for registering the land (about $330). "With this money (from selling the land) we are going to improve village,” said head of the village. “I have no idea what they are going to improve. Up to now we have seen no improvements here. There is no water even in brooks,” says Astghik. In order not to lose land plots Toroyan sold her cattle. However, money earned from selling cattle is nothing comparing with prices for land plots. Villagers accommodated her with money and gold so that she could get additional money against mortgaging gold in the bank.